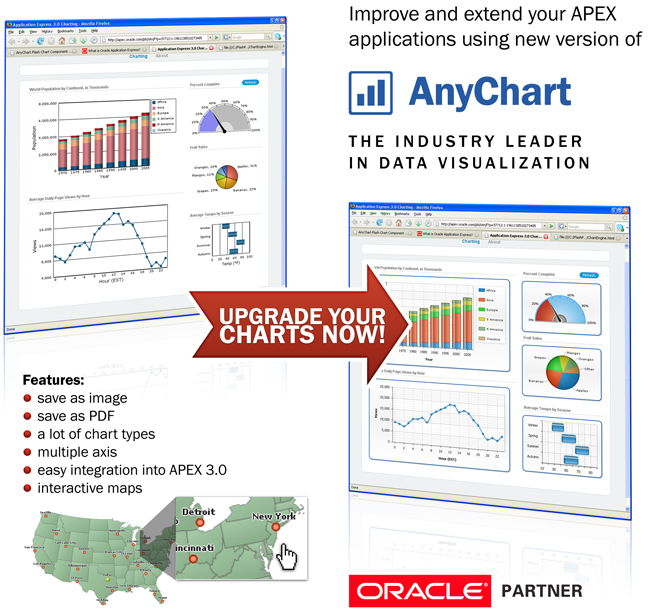 AnyChart and APEX Evangelists introduce an integration kit for new versions of our product. APEX Evangelists (AE) is an Oracle Partner company which 100% specializes in working with Oracle Application Express. Apex Evangelists are extremely knowledgeable in all areas of Application Express development and have extensive experience of working with the AnyChart products. 1. You contact APEX Evangelists to describe the details about your task and get the first advice about the integration. 2. APEX Evangelists provide you a special discount coupon code to purchase AnyChart products. 3. After purchasing AnyChart you contact APEX Evangelists to get the integration kit and start the process.